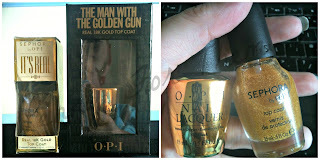 OPI released "The Man With The Golden Gun" as the Piece De Resistance of the James Bond 50th Anniversary in Christmas 2012 (the others included are HERE). 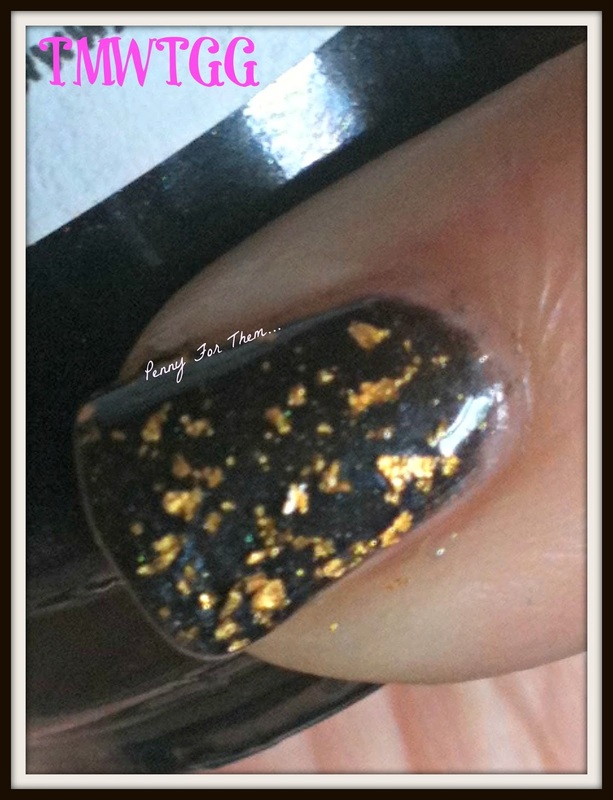 Its a clear polish base with pieces of 18k Gold flakes of different sizes and shapes. When first released this cost £25, and is actually still available in places -like HERE at Amazon.co.uk, but it says it only has ONE bottle at that price, so if you see these swatches and decide you NEED one...there's one there at the moment (could have changed by time of posting!). 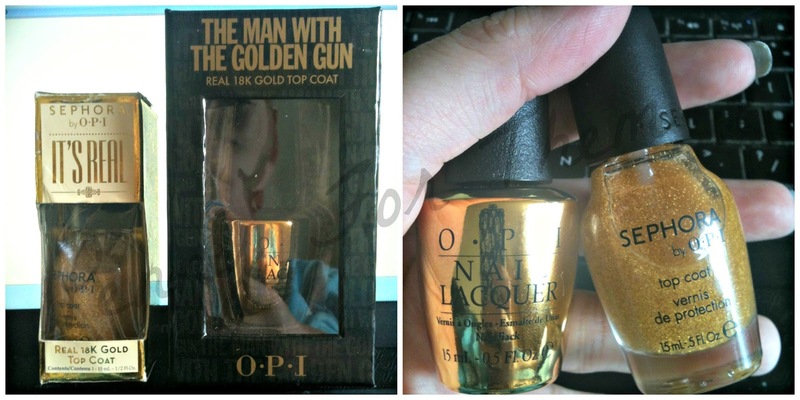 OPI also released an 18k gold one (called "It's Real") from their smaller named brand of "Sephora", which is widely available in the States, but not as easy to grab in the UK. Sephora can be got from France and posted to UK so there IS a way!! BUT bad news...this one is not being made any more and is pretty difficult to get a hold of. When released it cost $30, and was then found in sales for $10....but now, the best bet to find them is in Blog Sales that might have one to part with! Anyway, i had both of these and wondered myself how varied the difference was so had a check and thought id share the findings with you! They are actually very different - mainly due to the amount, size and shape. TMWTGG ("The Man With The Golden Gun" will now be referred to as this, cos its a heck of a mouthful!) is more of a flakie top coat. Bigger pieces of gold pieces mean less in amount though, so it depends really what kind of look you're going for. "It's Real" (IR from now on! ), however is bursting with tiny pieces and due to the small sizes it has a plentiful amount of gold pieces. So onto the swatches so you can see the difference, rather than being told it! 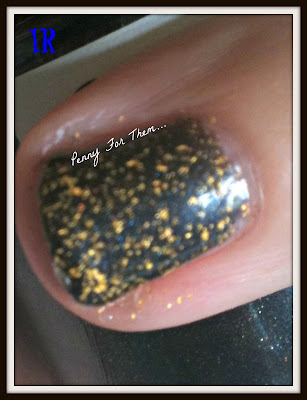 I used Pretty & Polished "Black Swan" as a base coat to show off the top coats, which is a black, slightly holo polish. I think you can see the difference, without the close up but thought it might help a bit more! Not sure how...but still i thought i'd do it! I have both of these. 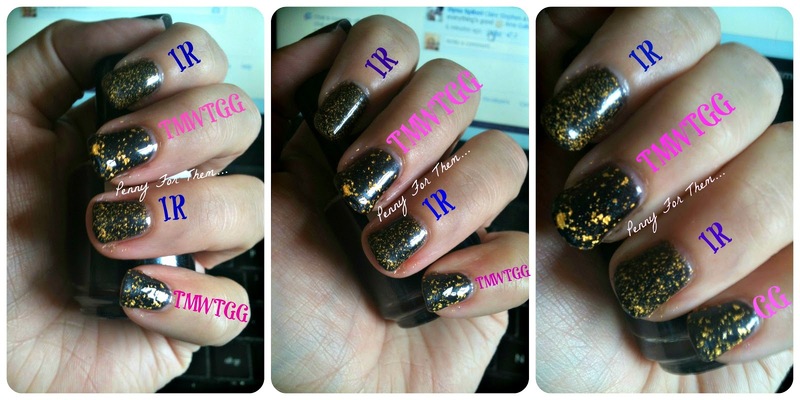 I've worn the Sephora, mainly because I've had that one a little bit longer and not had chance to wear TMWTGG. But they're both staying. They both have a great chance to shine in their own ways, depending on what kind of look you're going for! I would recommend it more on darker colours as the gold stands out fantastically, whichever one you choose (or can get hold of! )....i wonder if they're going to make a silver version of this....i'd be pretty interested if they did as i love silver, but i can imagine it would be difficult to make it look like a pure silver top coat rather than just another silver type, but we'll see what might happen i guess...! Any particular preference on these? Or are you like me, and it depends on what kind of day you're having with your nails!! This is the first time I've done a comparison, hope its OK!! I defo prefer Man with the Golden Gun!